Julius Rosenwald (1862-1932) was a Jewish multimillionaire merchant and one of the founders (1906) of Sears, Roebuck, and Company, then the largest department store in the United States. Rosenwald was a member of the Tuskegee University Board of Trustees (1911-1932) and collaborated with Booker T. Washington on the development of a program to provide public education for rural southern Blacks. Known as “Rosenwald Schools,” this initiative existed from 1913 to 1948 and resulted in the construction of over 4,977 schools, 217 teachers' homes, and 163 shop buildings in 883 counties in 15 southern states. This fit well with Rosenwald’s philosophy to “Give while you live.” His benevolence resulted in the development of the Rosenwald Fund, which supported the creation of many black YMCAs, YWCAs, and grants that encouraged many of the 20th century’s greatest black artists and innovators. Approximately half of his charitable gifts went to African American communities. 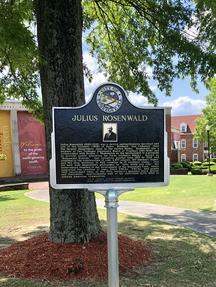 The Julius Rosenwald marker is at the traditionally Black, Tuskegee University. It is the first marker in a thirteen marker Tuskegee Civil Rights Marker Trail system. The marker system will tell the story of Tuskegee, the University, and the Community in the struggle for equal rights, opportunity and the American promise of possibility. The Tuskegee Civil Rights Marker Trail system is funded by the Jewish American Society for Historic Preservation.